Very recently I came across a scenario in the streets of Hollywood California. The big scene seemed a bit striking to the average person walking by as it was middle of the day in a crowded busy Hollywood street. A closer look caused me to be even more intrigued, there was a gentleman being arrested. He was in handcuffs and surrounded by three or four armed officers. Or were they really officers? An closer look surprised me even more. The "officers" were not police. They were not Sheriffs department or California Highway Patrol (CHP). They all wore a logo on their sleeves and a logo on an otherwise unmarked car that read "Andrews International Security Services" nothing else. They otherwise had all black uniforms and all were armed like police officers, looking scary and aggressive. After getting a photograph of their logo (which earned me a dirty look from them) and investigating them with the LAPD I was told by an LAPD officer that this private security company is part of a program called "Business Improvement District" (BID). The officer explained that they've been putting these security entities on the streets for at least a few years to his knowledge. Ultimately, the officer agreed with me that this was a very serious situation saying it was a "very interesting" concept in light of the Constitutionality and legality of it. These "Business Improvement Districts" go by many other names which all interestingly happen to have three letter representations (like government agencies making them sound official) including the Business Improvement Area (BIA), the Business Revitalization Zone (BRZ), Community Improvement District (CID), Special Services Area (SSA), and the Special Improvement District (SID). All of these groups are similar types of BIDs operating nationwide. Upon further research on this matter I discovered that this is a business model that first began in 1970 in Toronto where the first Business Improvement District (BID) was created in the 'Bloor West Village'. Here in the U.S. the first BID appeared New Orleans in 1974 touting themselves as the 'Downtown Development District'. A business improvement district (BID) is a defined area within which businesses pay an additional tax (or levy) in order to fund projects within the district's boundaries. The BID is often funded primarily through the levy but can also draw on other public and private funding streams... BIDs provide services, such as cleaning streets, providing security, making capital improvements, construction of pedestrian and streetscape enhancements, and marketing the area. Apparently the richest business owners in the neighborhood can collude together to form a private group which donate money to provide whatever "services" they agree is to the best interest of their business. Funding can come from both public or private entities and local government needs to determine that the majority of businesses want the BID before they enact legislation to create the BID. Local government does not consult with the community but instead with the business owners who are able to influence legislation to ensure the establishment of the BID. In fact most people don't know that BIDs have become a powerful lobby group pushing municipalities for certain services that they then select private companies to cash in on when the job is contracted to them. In other words, business owners have gotten together and formed yet another product that they are selling to the municipalities. That's right, your freedom to walk down the streets is being sold to private entities. What am I talking about? Or, so what, you might say, what's the big deal? As the document source states above BIDs are providing "services" such as street cleaning, making capital improvements, construction of pedestrian and streetscape enhancements, and marketing capital improvements. In addition to these services of "improvements", "enhancements" that serve corporate interest, they are also providing "security" because security is part of the "improvement". As I recently found out, this includes "International" private armed security companies who are being given the power to arrest people in the streets. When the state municipalities begin to sell the "service" of policing the people funded by programs that were not approved by the people but instead by a small group of business owners, we are walking down a slippery road to corporate tyranny. With the number of BIDs in American now increased from a small handful in the 1970's-80's we now have over 1000-1200 BIDs in the United States alone operating in cities throughout the United States without the approval of the people. The corporations are using this program to arm themselves against the people. This represents a large civilian army whose numbers are growing with no end in sight and this should concern all Americans who care about freedom, liberty and the Constitution. These private (PRO-Corporation) illegal "security" personnel are posing as officers and police and are spreading in the United States, and that is a direct threat to the people who have no say in who these people are and why they are roaming around in our streets. We are now approaching a time when these private security gangs or pseudo-police are looking to intimidate and bully Americans (which is exactly what I witnessed on the streets of Hollywood) who are walking the streets enforcing their own private set of rules, independent of the basic laws of the local government. Their private rules are based on whether you the pedestrian are interfering with the "improvement" or the "enhancement" or even the "marketing" of the general area where the private business cabal who formed the Business Improvement District (BID) to begin with, is conducting their business. This intriguing development is very much a part of the globalist restructuring of our world in the name of private profit and corporate despotism. This is another way in which private corporations are working hand in hand with local government to enslave the people and remove, arrest, charge and perhaps even beat or kill anyone who gets in the way of private profit. Let's not be fooled by back stage formations of these private business coalitions that are forming in our own towns while we work every day and do our own thing. They are catching on with these models and using them to take away your freedom, while they profit even more. If you see or learn of one of these organizations in your local community confront it. Find out everything you can about them and try to have a voice in what they are doing. Tell others about these programs and help inform voters from the perspective of the U.S. Constitution so that people can have a voice in this issue. Let your local government know that armed civilians enforcing security in the name of corporate profit is not what America is about and does not serve the interest of Americans. Big business owners are not America, they do not represent the interest of the we-the-people and their private security forces need to be dismantled immediately. Let this be a reminder that we truly are all created equal and it is the greed and arrogance that is often related to the pursuit of riches, power and control, that give men the delusion that he is greater than another just because he has more money and riches. This is all part of the superiority complex psychosis known as eugenics, which is ultimately driving the effort to create a one world government. Those that suffer from this mental disease truly believe they are superior to the average person and this psychosis is at the heart of this entire issue. Without this eugenic superiority mentality we would not be seeing what we are seeing in the streets of America. The eugenicists who are running many of the successful businesses today really believe it is up to them to control society and impose their personal wishes on the general public. Call it what you will, this has to stop and we must expose these programs. The officer I spoke with never did tell me why or how the private security company known as Andrews International Security Services is granted the authority to arrest Americans and I'm still investigating to see if this is true, but either way this is a red flag for all Americans to start sounding the alarm on now. As I mentioned before, the officer I spoke with seemed to agree that this was at the very least an issue of interest and concern, especially for anyone who truly understands the constitution. I believe we will hear more of this issue as we continue to march toward global tyranny and we continue to witness the presence of these mysterious "International" and private security corporations, donning the role of police and attempting to police a sovereign nation full of millions of Veterans and active and retired Officers who themselves swore an oath to defend the Constitution. These are signs of the times and I urge readers to take a stand against tyranny and the corporate-government funded new world order. If you don't take a stand now, you may not have a chance to take a stand tomorrow, for by then it will be too late. WHAT? 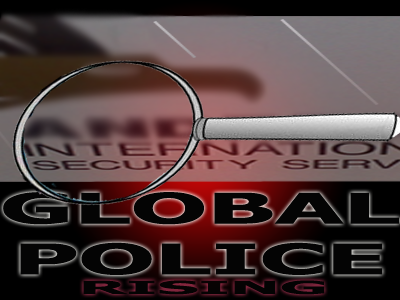 Armed "International Security" Personnel Now Arresting U.S. Citizens!